Spiral galaxy NGC 891 is immense. At approximately 100,000 light-years across, it's about equal in breadth to our own Milky Way. 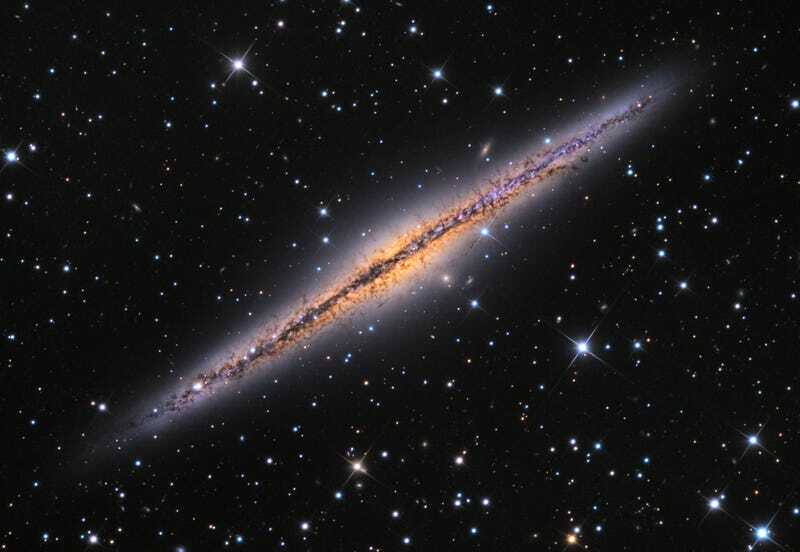 But from here on Earth, NGC 891 is seen from almost exactly edge-on, causing the vast cosmic disc to resemble a thin slice in the fabric of space. At first glance, [NGC 891] has a flat, thin, galactic disk and a central bulge cut along the middle by regions of dark obscuring dust. The combined image data also reveal the galaxy's young blue star clusters and telltale pinkish star forming regions. And remarkably apparent in NGC 891's edge-on presentation are filaments of dust that extend hundreds of light-years above and below the center line. The dust has likely been blown out of the disk by supernova explosions or intense star formation activity. Faint neighboring galaxies can also be seen near this galaxy's disk. This photo was captured by astrophotographer and astronomy educator Adam Block. We've noticed Block's handiwork popping up a lot lately – and looking at images like this, it's not hard to see why. For more of his photography, check out the image galleries at Mount Lemmon SkyCenter.